I’ve written for years that Chinese economic development is partly real and partly smoke and mirrors, and that it’s critical for investors to separate one from the other to make any sense out of China and its impact on the world. My longest piece on this topic was Chapter Four of my second book, The Death of Money (2014), but I’ve written much else besides, including many articles for my newsletters. There’s no denying China’s remarkable economic progress over the past thirty years. Hundreds of millions have escaped poverty and found useful employment in manufacturing or services in the major cities. Infrastructure gains have been historic, including some of the best trains in the world, state-of-the-art transportation hubs, cutting edge telecommunications systems, and a rapidly improving military. Yet, that’s only half the story. The other half is pure waste, fraud and theft. About 45% of Chinese GDP is in the category of “investment.” A developed economy GDP such as the U.S. is about 70% consumption and 20% investment. There’s nothing wrong with 45% investment in a fast-growing developing economy assuming the investment is highly productive and intelligently allocated. That’s not the case in China. At least half of the investment there is pure waste. It takes the form of “ghost cities” that are fully-built with skyscrapers, apartments, hotels, clubs, and transportation networks – and are completely empty. This is not just western propaganda; I’ve seen the ghost cities first hand and walked around the empty offices and hotels. Chinese officials try to defend the ghost cities by claiming they are built for the future. That’s nonsense. Modern construction is impressive, but it’s also high maintenance. Those shiny new buildings require occupants, rents and continual maintenance to remain shiny and functional. The ghost cities will be obsolete long before they are ever occupied. Other examples of investment waste include over-the-top white elephant public structures such as train stations with marble facades, 128 escalators (mostly empty), 100-foot ceilings, digital advertising and few passengers. The list can be extended to include airports, canals, highways, and ports, some of which are needed and many of which are pure waste. Communist party leaders endorse these wasteful projects because they have positive effects in terms of job creation, steel fabrication, glass installation, and construction. However, those effects are purely temporary until the project is completed. The costs are paid with borrowed money that can never be repaid. China might report 6.8% growth in GDP, but when the waste is stripped out the actual growth is closer to 4.5%. Meanwhile, China’s debts grow faster than the economy and its debt-to-GDP ratio is even worse than the U.S.
All of this would be sustainable if China had an unlimited ability to rollover and expand its debt and ample reserves to deal with a banking or liquidity crisis. It doesn’t. China’s financial fragility was revealed during the 2014-2016 partial collapse of its capital account. China had about $4 trillion in its capital account in early 2014. That amount had fallen to about $3 trillion by late 2016. Much of that collapse was due to capital flight for fear of Chinese devaluation, (which did occur in August 2015 and again in December 2015). China’s $3 trillion of remaining reserves is not as impressive as it sounds. $1 trillion of that amount is invested in illiquid assets (hedge funds, private equity funds, direct investments, etc.) This is real wealth, but it’s not available on short notice to defend the currency or prop up banks. Another $1 trillion of Chinese reserves are needed as a precautionary fund to bail-out the Chinese banking system. Many observers are relaxed about the insolvency of Chinese banks because they are confident about China’s ability to rescue them. They may be right about that, but it’s not free. China needs to keep $1 trillion of dry powder to save the banks, so that money’s off the table. That leaves about $1 trillion of liquid reserves to defend the Chinese currency, if so desired. At the height of the Chinese capital outflows in 2016, China was losing $80 billion per month of hard currency to defend the yuan. At that tempo, China would have burned through $1 trillion in one year and become insolvent. China did the only feasible thing, which was to close the capital account; (interest rate hikes and further devaluation would have caused other more serious problems). This distress might have been temporary if China had managed to maintain good trading relations with the U.S. But that proved another chimera. The trade war, which has broken out between the U.S. and China has damaged Chinese exports and raised costs on Chinese imports at exactly the time China was counting on a larger trade surplus to help it finance its mountain of debt. Now trade is drying up and China is stuck with debt it can’t repay or rollover easily. This marks the end of China’s Cinderella growth story, and the beginning of a period of economic slowdown and potential social unrest. The greater threat to financial markets will come, in my opinion from the slowing of global growth, at least partially due to the current state of international trade. This thought process is lent some credence by last night’s rather disastrous across-the-board macroeconomic numbers released by China’s National Bureau of Statistics. … For the Month of July, in China – Fixed Asset Investment.Growth slowed to the slowest pace since this data was first recorded back in 1992, printing in decline for a fifth consecutive month. Industrial Production. Missed expectations for a third consecutive month, while printing at a growth rate equaling the nation’s slowest since February of 2016. Retail Sales. Finally showing a dent in the armor, missed expectation while slowing from the prior month. Unemployment. This item has only been recorded since January. Headline unemployment “popped” up to 5.1% from June’s 4.8%. Oil Production. The NBS reported that Chinese oil production fell 2.6% in July, and now stands from a daily perspective at the lowest level since June of 2011. 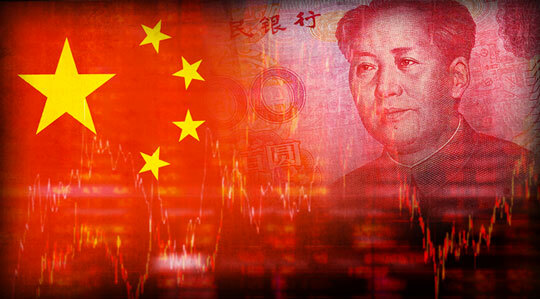 China will not report Q3 GDP until October 15. The National Bureau of Statistics reported annualized growth of 6.7% for the second quarter. Depending on the veracity of the data, one must start to wonder if China can indeed hang on to growth of 6.5% going forward. This unpleasant picture Sarge paints is based on official Chinese data. Yet, China has a long history of overstating its data and painting the tape. The reality in China is always worse than the official data reveals. This slowdown comes just months after Chinese dictator Xi Jinping was offered a dictator-for-life role by the removal of term limits and was placed on the same pedestal as Mao Zedong by the creation of “Xi Jinping Thought” as a formal branch of Chinese Communist ideology. The Book of Proverbs says, “Pride goeth before destruction, and a haughty spirit before a fall.” Xi Jinping now finds himself in precisely this position. His political ascension inflated his pride just as he now faces the reality of a falling economy and possible destruction of any consensus around his power and the lack of accountability. Trump continues to tighten the screws with more tariffs, more penalties, and a near complete shutdown of China’s ability to invest in U.S. markets. Turkey, Argentina, and Venezuela are large developing economies that are in different stages of collapse and threaten the global economy with panic through contagion. Yet, those three economies combined are not as large or important as China. Only Trump and Xi can salvage the situation with negotiation and reasonable compromise on trade and intellectual property. But, Trump won’t blink first; that’s up to Xi. So far, a spirit of compromise is not in the air. A spirit of Chinese collapse and contagion is.